Richmond National Cemetery in Henrico County, Virginia sits three miles southeast of Richmond. Established in 1866, the cemetery served as a centralized burial ground for Union soldiers who died in the campaigns to capture the former Confederate capital. 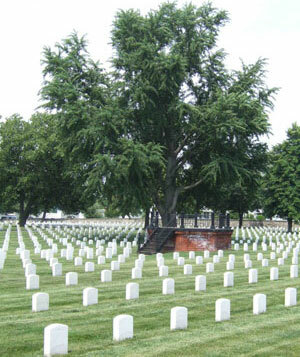 Today Richmond National Cemetery has approximately 9,300 burials, the majority of which are unknown soldiers. At the close of the Civil War, the remains of Union soldiers who died during the numerous battles in and around Richmond, including the 1862 Peninsula Campaign, the 1864 Overland Campaign, and the Sieges of Petersburg and Richmond, were scattered among the city’s cemeteries and battlefield burial grounds. When the Richmond National Cemetery opened in 1866, most of the first burials were reinterments of Union soldiers from other sites in the area. The reburied soldiers include 3,200 from Oakwood Cemetery in Richmond, 388 from Hollywood Cemetery in Richmond, 210 from the cemetery at the Belle Island Confederate Prison, and hundreds more from the battlefields of Cold Harbor, Seven Pines, and more than 70 additional sites within a 25-mile radius. Enclosed by a granite and sandstone wall built in 1890, the cemetery consists of 29 burial sections on 9.74 acres. At the center of the north wall is the cemetery’s main entrance, marked with an ornamental double wrought-iron gate, supported by stone pillars. 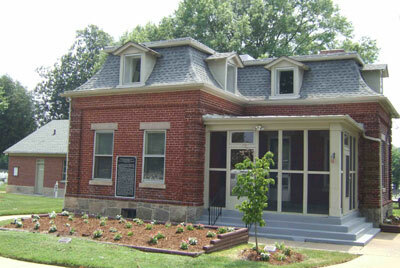 The historic superintendent’s lodge, designed by U.S. Quartermaster General Montgomery C. Meigs, was constructed in 1870. The lodge features a mansard roof, a distinctive characteristic of the Second Empire architectural style, and an enclosed porch added in 1936. The octagonal rostrum, which dates to 1890, is of a standard design used in the national cemeteries at the time. It is located in the southeast quadrant of the cemetery, at the corner of Sections 13A, 14A, 21A, and 22A. Originally, an iron tent-like roof supported by columns covered the rostrum, but the roof was removed in 1952 leaving the brick platform and iron railings and stairs. The cemetery's flagpole is located at the intersection of the central avenue and the major cross axis, sitting atop a raised grass mound. A pathway loops around the flagpole with four identical seacoast cannons set upright on concrete bases, each over 7-feet tall, on the exterior of the circle drive. Approximately 5,700 unknown Union soldiers lie buried in Richmond National Cemetery. One Confederate soldier, whose remains were discovered along the bank of the Beaverdam Creek in Hanover County, was reinterred in the cemetery in 1978. Richmond National Cemetery is located at 1701 Williamsburg Rd., in Richmond, VA. The cemetery is open for visitation daily from sunrise to sunset. No cemetery staff is present onsite. The administrative office is located at the Hampton National Cemetery, and the office is open Monday to Friday from 8am to 4:30pm; it is closed on all Federal holidays except for Memorial Day and Veterans Day. For more information, please contact the cemetery office at 757-723-7104, or see the Department of Veterans Affairs website. While visiting, please be mindful that our national cemeteries are hallowed ground. Be respectful to all of our nation’s fallen soldiers and their families. Additional cemetery policies may be posted on site. Richmond National Cemetery is one of seven national cemeteries in the Richmond area. The others include: Fort Harrison and Glendale National Cemeteries in Richmond; Seven Pines National Cemetery in Sandston; Cold Harbor National Cemetery in Mechanicsville; City Point National Cemetery in Hopewell; and Poplar Grove National Cemetery in Petersburg. Richmond National Battlefield Park, a unit of the National Park Service, preserves several battlefields and historic sites related to the 1862 Peninsula Campaign and the 1864 Overland Campaign in and around the former Confederate capital. Richmond National Cemetery was photographed to the standards established by the National Park Service’s Historic American Landscapes Survey.